Wacky Courses and Jammy Dodger Cocktails: Did We Swing For Junkyard Golf Club? Last updated 06 November 2018 . By Sarah Bartlett. 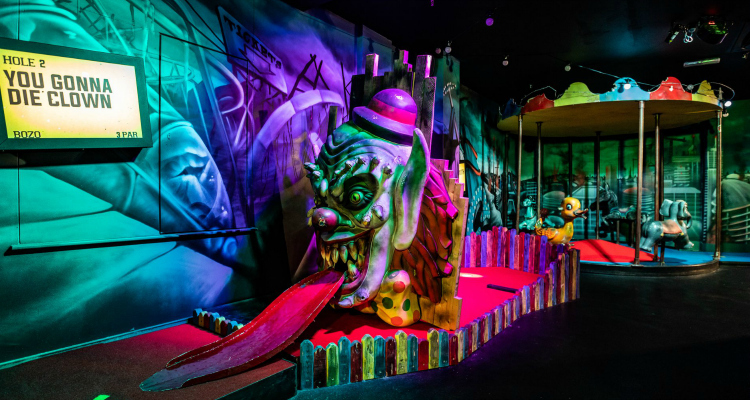 Crazy golf has been given an after hours, booze-infused twist in the latest instalment to hit Leeds’ party scene. Stepping into Junkyard Golf Club, pitched up nicely in The Light, you’ll have the choice of three crazy 9-hole courses. There's Pablo (fun in the jungle), Gary (wheeling and dealing in the junkyard) and Bozo (circus gone wrong). Drop your coat and bags at the door, grab your wristband and jump in the golf caddy for a quick gram-worthy selfie before heading upstairs. The main bar serves utterly ridiculous cocktails which you’d be bonkers not to try. With names like Ribena Turner (£7.50) and Tequil-ing Me Softly (£7.50), the 90s kid in you will have a field day, especially as they’re served in red solo cups and laced with toppings like Jammy Dodgers. There are bars halfway round each course too so there’s plenty of opportunity to quench your thirst after a few swings. Weirdly named but with fantastic attention to detail, each course presents its own themed obstacles and cracking puns. We played Pablo first; Aztec temples, giant insects and a jungle bathtub await, but not all is as it seems. Did I mention the jungle massive UFC bears? The size of your team will determine how long it takes you to complete the course (average is around 45mins), so if there are only a couple of you - date night joy - you might want to double up on the courses. Creepy abandoned fairground rides and clowns galore, Bozo is filled with even more surprises than Pablo. Look out for Loopy Fiasco and Ferris Ballers Play Off, my personal favourites. Whether you’re in the mood for a Jungle Run-inspired adventure, Scrapheap Challenge liaison or messed up clown party, round up your squad and tee off for a night of putting and cocktails. Just leave the sweater vest at home, okay? You'll find Junkyard Golf Club at The Light, The Headrow, Leeds LS1 8TL. Tickets are £8 per person Sunday to Thursday, creeping up to £9.50 on Fridays and Saturdays.